NEWARK, N.Y. – Head coach Chris Haynes has announced the hiring of former Le Moyne College teammate and St. Louis Cardinals draft pick Chris Edmondson as an assistant coach for the Newark Pilots of the Perfect Game Collegiate Baseball League (PGCBL). “(Haynes) and I were really good friends at Le Moyne and we hit back-to-back in the order for most of our time there," Edmondson said. "We work really well together. I am excited to get to Newark and to compete, and see what we can do together." “I am very excited to bring Chris on as my assistant because I know he is very knowledgeable and had a very successful playing career in college and professionally,” Haynes said. "He's one of the best hitters I've ever played or coached with and he will be a great asset to the Pilots this summer." 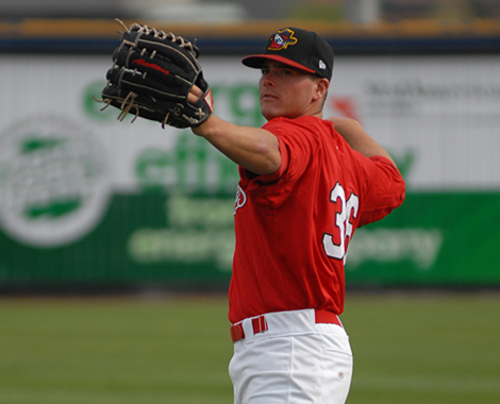 Edmondson, 27, spent three seasons in the St. Louis organization after being selected by the Cardinals in the 43rd round of the 2010 MLB First-Year Player Draft. He then became the first player in the history of the Rockland Boulders of the independent Canadian American Association of Professional Baseball (Can-Am League) to have his contract purchased by a major league club in 2013, and he ended his pro career that year with the Atlanta Braves' Class A affiliate in Rome, Ga.
"I learned so much during my time in professional baseball," Edmondson said. "I want to give all the information that I have to these kids trying to get to the next level because that was my dream and I lived it." The Newark Pilots return to Colburn Park for their 2015 home opener on Friday, June 5 against Mohawk Valley. For more information and to purchase season tickets, contact Pilots president Leslie Ohmann at 315-576-6710 or visitwww.newarkpilots.com. Fans can like the Pilots on Facebook at www.facebook.com/newarkpilots, and follow them on Instagram and Twitter @NewarkPilots for the latest information.